. Since he has little no intention of making those sausages again (being from a traditional Italian family, he thought they were a failure; yet all the vegetarians in the house loved ’em), he gladly gave us the remaining “hippie” ingredients. Not quite sure what to do with the garbanzo flour, I figured I’d try the recipe on the back of the bag: Hummus! I had no idea that one could make hummus from garbanzo flour (I’d always started with whole garbanzo beans), but if it’s a recipe on the back of a Bob’s Red Mill bag, it’s bound to be good. So, it’s my pleasure to present this recipe to you today — because nothing says “Happy Holidays” like a plate of garlic hummus! A note for beginner cooks: I think hummus is a wonderful way to get a feel for cooking — it’s tough to mess up! Although you’ll want to get the water/flour proportions correct, beyond that most of the ingredients can — and should — be adjusted to taste. I like more tahini in my hummus, so I simply add more. You might like more garlic, dill, or other seasonings (try red bell peppers or red chili flakes! ), so why not give it a try? This is a delicious hummus that is super easy to make and perfect for using as an appetizer. In a medium saucepan, bring the water to boil. Whisk the garbanzo bean flour into the boiling water (don't worry if it gets a little clumpy). Cook on medium-high heat for 1 minute, stirring constantly. Reduce the heat to medium-low and cook another 5 minutes, stirring constantly. Let cool. Transfer the garbanzo bean paste into the bowl of a food processor, pitcher of a blender, or a large bowl if using an immersion blender. Add the garlic, broth, tahini, lemon juice, and tabasco sauce. Blend or purée until smooth. Mix in the cumin, dill, salt, and pepper. Slowly add the olive oil while blending/processing/immersing until it's blended well. If the mixture is too thick, add a little more broth or olive oil. Scrape into a bowl and cover with plastic wrap. Let set for at least an hour, then give it a taste. Add more lemon juice, salt, pepper, or herbs as desired. When serving, spoon onto a small plate, drizzle with a little olive oil, and sprinkle with paprika... 'cause that's how they do it at Pita Inn. Thanks for sharing, Michele. I originally bought garbanzo bean flour for hummus, but I have over half the package left even after two large batches. I can’t wait to put the flour to another use! Is that how come the stuff in Medeterian places is so creamy, they use garbanzo flour? I always wondered why I can never seem to get it as creamy as they do there. I will have ot try this for sure, we love hummus and this will be a lot cheaper and probably healthier than buying it in the deli case to get the creamy hummus. Thanks! 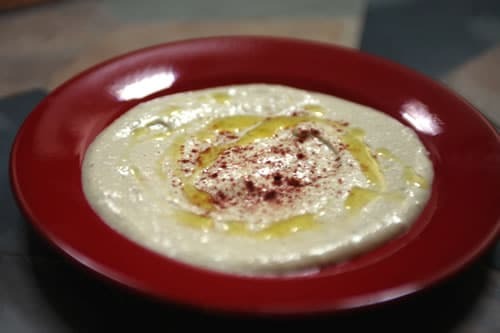 To get a fairly creamy hummus from regular garbanzos you need to basically emulsify the oil, tahini and water into the beans after pureeing them in the food processor. Do this with the processor running and it will become very creamy – got the recipe from Cooks Illustrated – works very well and improves the flavor IMHO. I saw the garbanzo bean flour and picked it up on a whim, and came home & Googled “Hummus from garbanzo bean flour” and found this. Ironically, there isn’t a hummus recipe on MY bag of Bob’s Red Mill GB flour. That is different. I wouldn’t have thought of using garbanzo beans flour. I will definitely try this. Michele – That Socca recipe sounds amazing. I had never heard of Socca before, so thanks for introducing me! I’ll have to give it a try, for sure. Bonnie – I hadn’t thought of it, either! I credit Bob’s Red Mill’s good sense to put that recipe on the back of the package. Kristy – Not sure how they do it in the Med… but I do think that the creaminess is likely from the flour instead of whole beans. Mine actually came out a little thinner than I would have liked — so you may want to go just a little heavier on the flour than the recipe calls, since it’s much easier to thin it than thicken it. Let us know how yours turns out!